What metal vessels do you use for cooking? Want to know the healthy ones? Ayurveda, the ancient science of healing and good health advocates not only medicines and herbs, but also gives immense importance to the metals that we use for cooking our daily food. While modern living has made us turn towards the more convenient steel, glass and non-stick cookware, old-school utensils are noted to hold therapeutic benefits, whether you use them for cooking, or to eat your meals. In fact, while glass and steel are fairly neutral, coated or non-stick pans could even be detrimental to the health of your skin. Listed below are benefits of cooking in various metals. Copper is the best metal for cooking rice. You can also store water overnight in a copper utensil, and drink your first glass from this to enjoy the benefits of this wonderful metal. 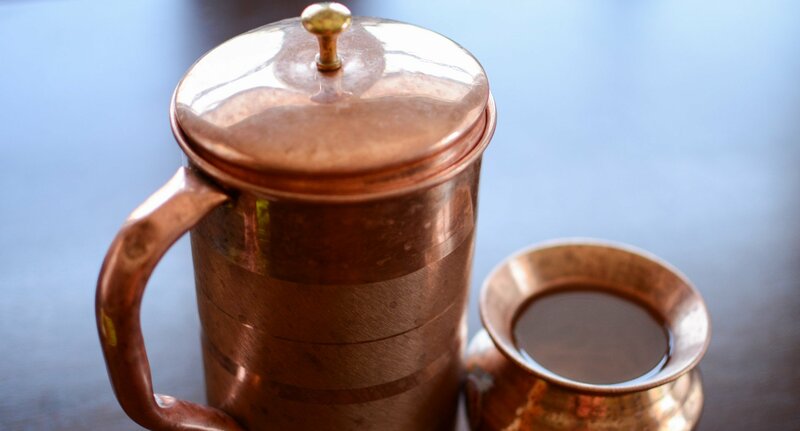 Science has now proved that copper-rich foods boost collagen. Therefore, this metal offers advantages for the skin too. It also detoxifies the body, helps increase haemoglobin, improves the secretion of bile and the peristaltic movements of the gut to aid digestion as well. Silver has a cooling effect, hence it’s the best for pitta personalities.If you’re a pitta type, you’ll have red, reactive skin, and will be quick to anger. Eating out of real silverware will calm down your temperament and your complexion. Silver is also good for people who have dizziness and excessive thirst, it also calms down inflammation and increases sperm count. Drinking water stored in a brass vessel increases strength and immunity. In addition, it also helps pacify pitta (burning sensations, aggression), increases haemoglobin count, and improves the general condition of your skin. Though this ancient metal is rarely used nowadays, it helps reduce obesity, improve eyesight and skin condition. Clay is closest to earth and hence has immense benefits, whether you use it for cooking or eating. Itoozhi Ayurveda conducts therapeutic clinics for various ailments.